Projections of rainforest in Ecuador, coupled with the sounds of rustling trees and rushing water. Visitors to the gallery are engulfed in the sounds and colors of the installation. Photo by Christina Bulosan. Behind a black curtain lies the Ecuadorian Amazon. The sounds of rustling trees and flowing rivers and a hue of emerald green fill the room. The Mary Porter Sesnon Gallery is transformed into a lush forest. The indigenous tribes who call this landscape home have been threatened by oil corporations. In hopes of preserving their homes, they reached out to lawyers and experts to take their cases to court in 2008 and 2011. 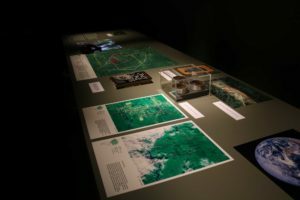 Ursula Biemann, video essayist and artist, collaborated with urbanist architect Paulo Tavares to re-present these court cases in their exhibition ‘Forest Law’, showing until Dec. 1. ‘Forest Law’ examines the court cases of the Kichwa people, who live in the Sarayaku region in Ecuador, and other indigenous Amazonian groups through video interviews and geological maps. 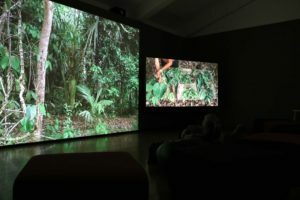 By portraying deforestation with two projectors and an interactive table, the exhibit allows the audience to reach a new understanding of deforestation. Details of the research on the Sarayuku region in Ecuador where the Kichwa people and other indigenous groups live. The props on the table are interactive and deepen the audience’s understanding of deforestation. Photo by Christina Bulosan. Through Biemann’s and Tavares’s interpretation, ‘Forest Law’ gives an alternative view of the struggles and beliefs of the indigenous groups affected by Amazonian deforestation. The viewer learns that these tribes believe the earth to be part of them — living and breathing as if human. The exhibition highlights the 2008 addition of the Rights of Nature to the constitution of the State of Ecuador. Ecuadorians gathered to give nature this set of inalienable rights, which include respecting the earth for its maintenance and regeneration. The Sarayaku case in ‘Forest Law’ explains the Kichwa People’s fight against oil concession across 200,000 acres. The Kichwa held rights on their land, but only on its surface. The state of Ecuador claimed to have authority over geological resources, and so in 2011 the Kichwa people took their case to court. The Lago Agrio case, which is also included in ‘Forest Law”, looks at the 26 years Texaco had been dumping toxic waste into the soils surrounding the area that margins the Aguarico River and the Colombian border. The indigenous groups who lived in the area faced years of severe contamination due to the dumping. They banded together in 1993 to file a lawsuit against Texaco. In 2011, the destruction ended when they won the case. The importance of this particular space in the Ecuadorian Amazon lies in its unique biodiversity. It is also home to many indigenous groups with unique cultures and ties to their land. By representing these issues as one the audience is able to grasp a complete view of life in the Ecuadorian Amazon.